For some couples, there’s nothing more ideal than wedding-day transportation in a classic stretch limo. It’s hard to argue with their logic — a stretch limo is a luxurious, comfortable and classy option, and you can’t go wrong arriving at the reception and stepping out in style from behind the vehicle’s darkly tinted windows and shiny exterior. But what if you decided to do something different for your wedding? Have you thought about doing something unique with your wedding transportation? 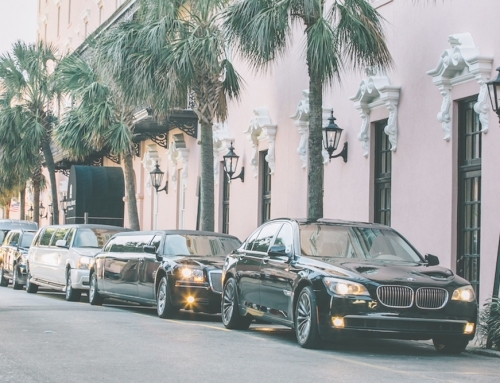 Stretch Limos and More From Lowcountry Valet & Shuttle Co.
At Lowcountry Valet, we understand the appeal of the classic stretch limo, so you can be sure that we have that option available. Our gorgeous Chrysler 300 limousine fits the bill and provides the traditional wedding transport. We also feature two-passenger BMW vehicles for couples that want to travel and arrive in style without the entourage. Additionally, our fleet features buses, a Cadillac Escalade limo and executive coach limos! Regardless of the size of your party, our selection of modern wedding transportation vehicles has something for everyone. Perhaps you’re interested in going even further away from traditional wedding transportation. In your case, what do you do? Thankfully, we’ve thought of people like you, which is why Low Country Valet features an extensive fleet of eye-catching vintage vehicles. These classic cars may be old, but they look brand new. We take pride in making sure that our vehicles are clean and classy. It’s important for us to meet and exceed expectations, so we ensure that we look as good as you do on the big day! Our Vehicles are Great for Photography! The wedding day is just the start of a lifetime of joy, but you’ll revisit it time and again through video and photos. Our unique vehicles are incredibly photogenic, so when you look back, you’ll remember the great times you had in one of our truly unique wedding transportation vehicles. Are you interested in learning more about our fleet of unique vehicles for your wedding? Call us at (843) 810-0107 and find out how you can go beyond the stretch limo.